On Friday, Sept. 21, at 7:30 p.m., the varsity football team will take on the Redan Raiders at Walsh Field to kick off the 2018 Homecoming festivities. Come out and support the Knights and enjoy the festive tailgate parties and awesome half-time ceremony. Seven matches is a ton of volleyball! It began Wednesday, Sept. 12, with a long ride to Allatoona High School to play both Mount Paran Christian and Allatoona. Pace battled to within 2 points of Allatoona in the first set, losing 25-23. The second set wasn't close as Pace could not rebound physically, and Allatoona cruised to a 25-12 victory. Fortunately, the Knights found their focus and played much better against Mount Paran, although they still came up short, losing in two very close sets 26-24 and 25-23. Friday and Saturday marked the Lovett Block Party in which 16 teams competed. Pace played Newnan, North Cobb and Harrison (last year's 6A state champions) in pool play and walked away with two victories to finish second in the pool. Pace really missed starters junior Lucy Ferry, out with a sprained ankle, and sophomore Kalissa Greene, out for a full set with a possible concussion. Against a very good Harrison squad, the team showed a lot of grit and determination with senior Davis Mathis setting for the first time this year. Mathis finished the set with an impressive 10 assists. Greene was cleared and able to rejoin the team for the remainder of the day, which was good news for the Knights. The Knights won the gold bracket playoff match versus South Forsyth in two straight sets to advance to the gold bracket semifinals against Alpharetta. Running on fumes, Pace won the first set 26-24. The next set was just as close, but Alpharetta took it 25-23. The third set was a battle of fatigue, but Alpharetta prevailed 15-10 and went on to win in the finals. Senior co-captain Alexandra Baker led the offense, hitting .304 with 51 kills. Junior co-captain Ada Jane Agolli followed, hitting .243 with 37 kills. 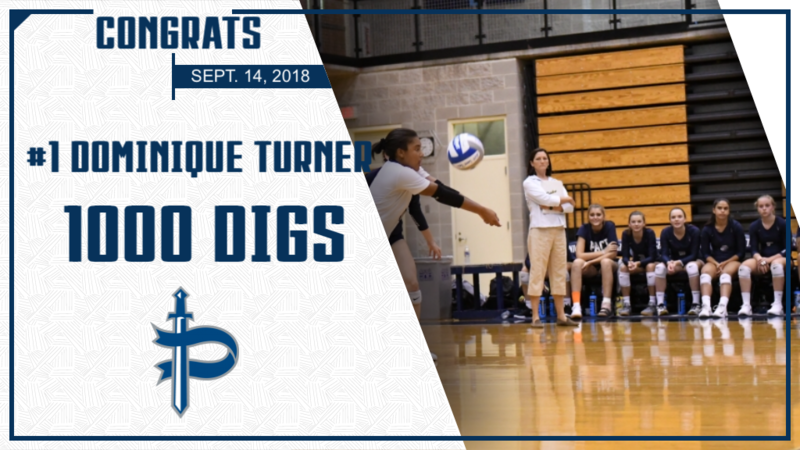 Greene added 70 assists, and junior Dominique Turner added 44 digs, which helped her surpass 1,000 digs for her career at Pace! Pace travels to Spartanburg, S.C., this Friday, Sept. 21, and Saturday, Sept 22, to play in the Dorman Tournament of Champions. Due to inclement weather, the varsity softball was unable to play a region game against Westminster on Tuesday, Sept. 11, and a game against Mount Vernon on Wednesday, Sept. 12. The games have not yet been rescheduled. The Knights, however, played a round robin at Riverview Sport Complex on Saturday, Sept. 15, losing to Holy Innocents' 4-2 in a highly competitive pitching and defensive game. Sophomore Sydney Silverstein pitched four innings, allowed three hits and two runs and struck out five. Junior Caroline Landis closed the game, allowing two hits and two runs, with six total strike outs. Sophomore Jaime Kornheiser (run scored), sophomore Helena Harris, senior Caelan Corbally (RBI, run scored), sophomore Lane Brickley (RBI) and Landis all recorded hits for the Knights. They ended the day with a 1-8 loss to Fannin County. This week, the Knights will play two region games away. They'll face Towers on Thursday, Sept. 20, and Stone Mountain on Friday, Sept. 21. Both games start at 5:30 p.m. The Pace mountain bike team took to the trails on Sunday, Sept. 9, to compete in the first race of the 2018 Georgia Interscholastic Cycling League season. The trails adjacent to Road Atlanta in Braselton offered the riders some of the smoothest single track they will encounter all season. In the freshman boys race, Sam Brooks led the Knights with a 27th-place finish and a time of 45:57 on the 8.6-mile course. Brooks was followed by freshman Jack Warren, who finished 49th with a time of 49:21; freshman Connor Vance, who placed 60th with a time of 51:26; and freshman Jude Black, who finished 66th with a time of 52:41. In the sophomore boys race, Aiden Critz put in a strong performance for the Knights, finishing 11th with a time of 43:13 on the 8.6-mile course. In the JV boys race, junior Ben Tolliday led the Knights with a 15th-place finish and a time of 1:02:38 on the 12.9-mile course. Tolliday was followed by senior and four-year mountain bike team veteran Ben Solomon, who was in 31st place when the riders were pulled from the course due to inclement weather. The Knights will take to the trails again on Sunday, Sept. 23, at Allatoona Creek.